My signs aren’t the prettiest thing in the world. They are rather simple in design and material. Made from 2×3’s and 1/4 inch plywood screwed together with dry wood screws, they’re painted with white gloss paint for ease of artistic design. The signs can either be directly drawn on or you can staple poster-board to them. 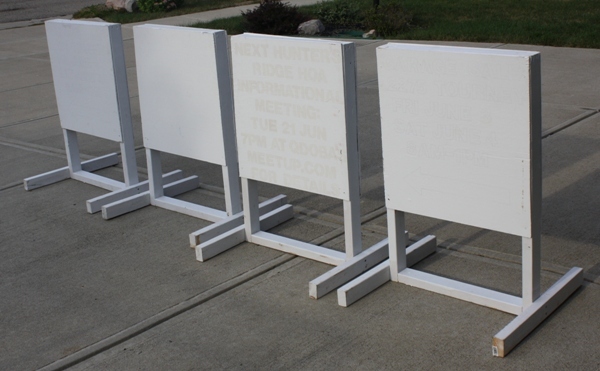 The sign frames are 2′ wide by 3′ tall with the plywood cut into 2′ by 2′ sections. Despite their rather bulky appearance, once the lower stabilizing 2x3s are removed, the six signs I built stack up flat and neatly on a shelf in my third car garage. After each use we decide if we’ll repaint them or keep the artwork around until the next time we use them. As you can see, black sharpies require several coats of paint to completely eliminate. However, as you can also see, the signs have been the source of several household art projects for the kids — like chalk on the driveway, except they can see their handiwork months or even years later. The sign design also allows for easy storage of the stabilizing 2×3’s as well as the screws in Ziploc baggies. When I made the signs I didn’t have a power miter saw or a table saw. 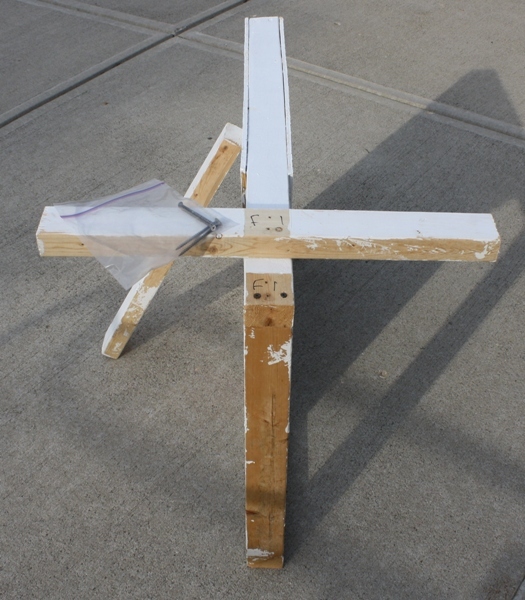 The local big box cut the 2′ by 2′ plywood, and I used a power circ saw to cut the 2×3’s. Basically anyone could put together this design. Labeling each of the stabilizing 2×3’s helps keep my sanity when I’m trying to line up the screw holes, too. The signs may be less than fancy, but they work. They also have been the focus of hours of summer fun and tools to teach our kids how to paint — whenever we decide to host a party or event, the signs become a family-focused item. Have you used any creative signs for events? Do you have any sign suggestions for other Toolmongers? Let us know your Toolmonger sign wisdom! Simple sandwich board signs made of MDO, hinge at top, chain or rope at bottom to hold the “A” shape. Put a sandbag inside (over the rope or chain) for windy conditions. You can also easily do a variation with corner loops for stakes if you’re setting up on dirt or turf. They fold up very thin and are easy to store. Rout out a top center opening for a handle if you like. I can see you hosting a track meet (hurdles) at your place, or perhape a four-position target shooting match. Nicely done on the sign boards…but I live in America and within five minutes of being placed out on the sidewalk they would be gone. There’s whiteboard paint that might make a quick-change version…Sherwin’s got a good one. I was thinking of doing this in a similar fashion but with chalkboard paint for car shows and such. I did something similar, but with bar tables. My parents like to entertain, and found themselves renting bar-height belly tables often. Last fall, my mom asked me if I could make something. Since I was getting married in a couple months, I figured I could whip up something, and use them for the wedding, then give them to my mom. I took a sheet of 5X5 ply, and cut it into quarters for the top. I made a jig to drill four holes squarely and evenly, and put in 1/4-20 T-Nuts. Then I welded a plate on top of a central pillar I fabbed out of some steel tube I had around. I built detachable legs out of 1X3 steel, with a hook and a tab that would go into 1/4-20 rivet nuts in the central pillar. Even though I used a jig to make everything even, I painted each base a different color, and matched it to the table top. That way, you can assemble by color-coding. Since we will always use some sort of table cloth, I just sanded and primed the wood tops. The whole thing goes together with a single wrench and eight identical (1/4-20 X 3/4) bolts. When I get around to it, I plan on welding on little tabs to the bolt heads so that you can omit the wrench. If I think about it, I’ll put up some pictures on the Toolmonger photo page. @Bajajoaquin – great idea, makes me want to take up welding! 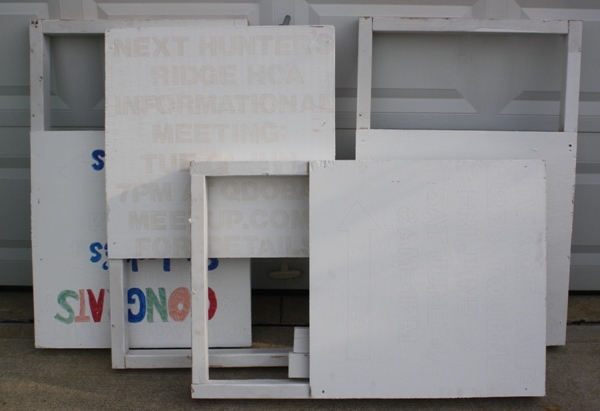 We currently use a realtor sign that’s made up of light steel angle… rectangulart top part covered with corrugated plastic board that can be decorated or hold posterboard. It’s got a loop at the bottom for pushing into the ground with your foot. BTW, Old Dude: sorry to hear it. I live in the USA, where I can leave sign OR my yard sale goods OR my bicycle, etc. out front and find that it’s still there when I come back. Sorry about your America.